December 04, 2018, 6:00 p.m.
After tricking social media influencers into paying premium prices for discount shoes, Payless ShoeSource is showing its own power to sway the minds of consumers. On November 28, news began to spread that Payless, the footwear retailer known for budget-friendly items, had created a fake luxury store in Santa Monica called Palessi — along with a fake website and fake Instagram account — and filled it with regular Payless products. The brand invited influencers to the grand opening, put huge markups on the pumps, boots, and sneakers, and reportedly generated around $3,000 worth of sales in the first few hours, as well as praise from some attendees for the quality and design of the shoes. Payless turned footage of the private event into an ad campaign, which has received a healthy amount of media attention. According to new numbers from YouGov Plan & Track, the marketing push seems to be working. 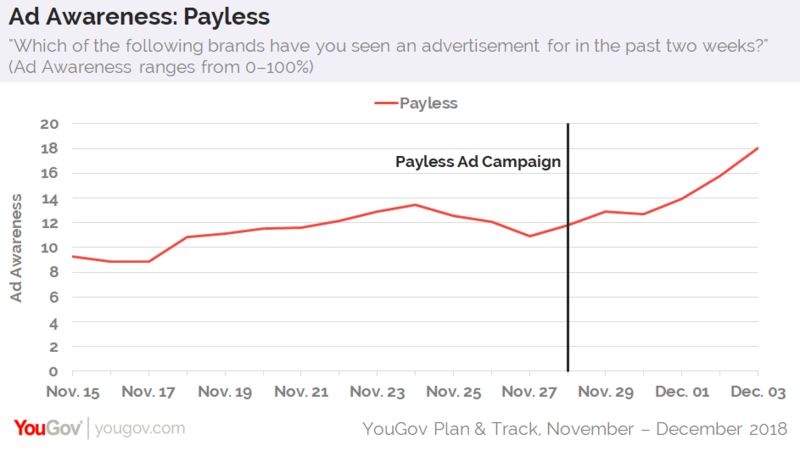 Data shows that the percentage of US adults who recall seeing an ad for Payless in the past two weeks has climbed from 12% on November 28 to 18% today. The amount of consumers aged 18+ talking about Payless with friends and family has also increased from 7% to 9% within the same time period. A closer look at the data, however, suggests that not everyone is pleased with the PR stunt. When asked if they’ve heard something either positive or negative about Payless in the past two weeks — whether through news, advertising, or word of mouth — consumers aged 35-49 appear to lean more toward the positive, while those aged 18-34 gravitate toward the negative. 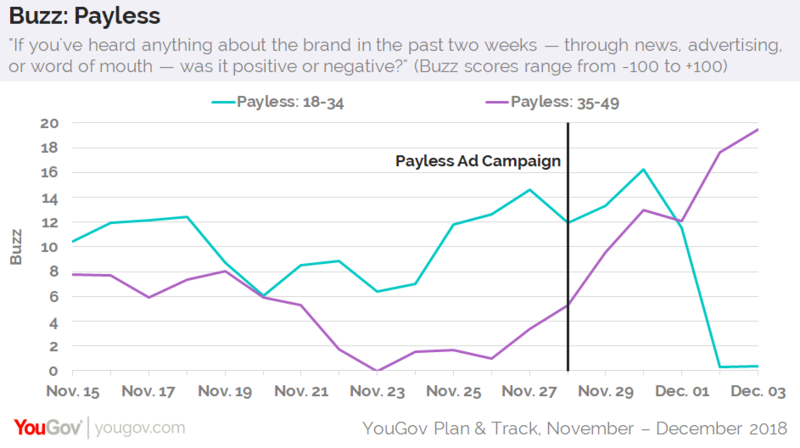 More specifically, on November 28, consumers aged 35-49 gave Payless a Buzz score of 5. At present, the score has increased to 20. The retailer’s Buzz score among millennials, on the other hand, has decreased from 12 to 0. Overall impression of Payless has moved in similar directions among the two age groups: up with consumers aged 35-49; down with consumers aged 18-34. Additional data from YouGov Plan & Track shows that 74% of consumers aged 18-34 like to get advice before buying news things, compared to 70% of consumers aged 35-49. Furthermore, 24% of younger shoppers admit that celebrity endorsements have an effect on their purchasing decisions, while 19% of older shoppers say the same.